Locals enjoying an evening excursion on The Angler III in Port Washington, NY. What's better than spending a day on the water? Whether you're looking for a private charter boat for an unforgettable excursion, or a party boat fishing trip is more your speed, Port Washington is your go-to destination when you're looking to set sail for fun! If you're thinking about planning an excursion on the Sound, let Port Washington be your port of call - there's plenty of charter boats and private rentals at your service, ensuring that your trip is hassle free, so you can focus on what's important - having fun and fishing! When it comes to fishing on the Sound, the journey is half the fun, and Port Washington's Fishing Charters know how to ensure your day of fishing is memorable, relaxing, and something you won't soon forget! 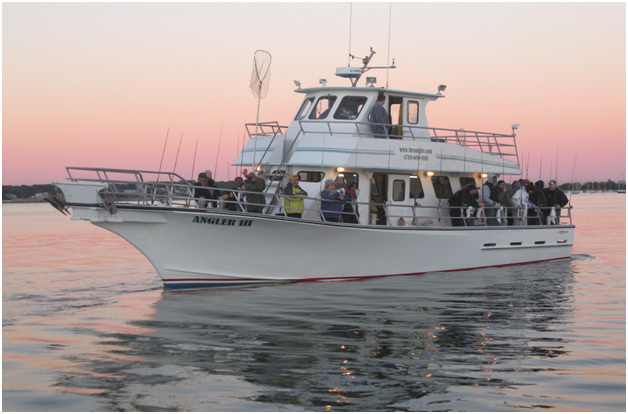 Set sail for fun on the Long Island Sound this Summer on one of Angler Fleet's open fishing boats or private charters! In addition to party boats & charters, the Angler Fleet offers fireworks cruises, nature cruises and Summer adventure programs for children! Long Island Boat Rentals has 4 fishing boats available for rent daily from 13’ to 22’, including during the early morning “fishing hours”. Enjoy great fishing in the waters of Western Long Island Sound and Manhasset Bay through Long Island Boat Rentals. Call and book the perfect fishing boat for you, and ask them to stock it with bait, ice and water so you can jump in and go get the fish. Not sure where the fish are in the area? Ask us about where the fish action is, and take advantage of the local bait and tackle store on premises. Atlantic Outfitters carries a wide variety of bait including fresh and frozen bunker, chum, bunker milk, sand eels, squid, clams, live eels, sandworms, and live green crabs. There’s even a 24-hour bait vending machine right outside the shop. Boat and fishing rod rentals are also available.